The August 15&22, 2011 issue of The New Yorker includes an article in the Dept. Of Gastronomy section by Dana Goodyear, entitled “GRUB, Eating bugs to save the planet”. Many react with the ‘ick’ factor when hearing about things others will eat that we in this country have not considered before as food. As a vegan, for health, environmental and ethical reasons, I frankly don’t see the difference between eating a cow or a dog or a bug. Nor do I see a difference in the ‘ickiness’ between the breast of a chicken or the eye of a grasshopper. Body parts are body parts, whether you eat them or not. What bugs me is not whether people choose to try specialty foods from around the world, including insects, but that we are not focusing on what is really essential for personal health and the health of the planet. People need to eat a diet rich in fruits and vegetables. People in the United States eat far too much animal protein which contributes to the poor health Americans are experiencing. 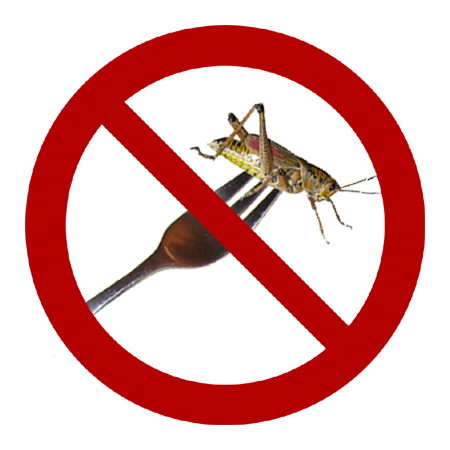 We don’t need to eat bugs for protein. Fruits and vegetables give us all the quality protein we need. And the article continued the myth that plants don’t provide complete protein when talking about Florence Dunkel’s “frustration working in West Africa where for decades European and American entomologists… have killed grasshoppers and locusts, which are complete proteins, in order to preserve the incomplete proteins in millet, wheat, barley, sorghum, and maize.” All plant foods contain all the essential amino acids humans need. People, vegetarians or omnivores, thrive when they eat high volumes of unrefined plant foods. If we really want to save the planet, we need to eat less animal foods, eliminate factory farming which is destroying the environment and focus on growing and eating organic, whole plant foods. If you want to garnish your salad with a few fried stinkbugs, be my guest. Personally, I prefer pecans. Knowledgeable food experts agree that the best COMPLETE protein comes from meat; fruits & veggies give only INCOMPLETE potein – missing Vitamin B-12! And taking a food supplement isn’t as nutritious as the real thing! Knowledgeable food experts do agree that a diet rich in whole, unrefined plant-foods is best. Plant foods give us all the essential amino acids we need, which is why they are complete proteins. In addition, plant foods give us fiber and phytochemicals which you can’t get from meat. Meat comes with cholesterol and saturated fat which are linked to heart disease, and animal protein leaves us with an unhealthy acid imbalance which can weaken our bones. Dr. Fuhrman is one such knowledgeable food expert, whose book Eat to Live was recently in the top ten ‘How To’ books on the New York Times best seller list, followed by Forks over Knives, now on the list, based on work by food experts Dr. T. Colin Campbell and Dr. Caldwell Esselstyn. Vitamin B12 has nothing to do with whether a food is a complete protein or not. Vitamin B12 is made by bacteria, including bacteria that is found in our digestive tract and those of animals. As we age our ability to absorb B12 from food deteriorates. The Food And Nutrition Board recommends that all people over 50, meat-eaters and vegetarians alike, supplement B12. To learn more, tune in next week, 8/24/2011, to our podcast IT’S ALL ABOUT FOOD, 3pm ET, with special guests who are food experts, Jack Norris, RD and Virginia Messina, MPH, RD. They will be talking about their new book, Vegan For Life, Everything You Need To Know To Be Healthy And Fit On A Plant-Based Diet.